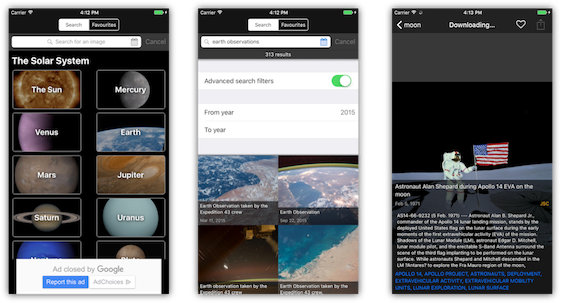 Search the entire NASA image archive with Endeavour, a new app for iPhone and iPad! Find images from new NASA missions such as New Horizons and Cassini, as well as historical images from Voyager and the Apollo moon landings. 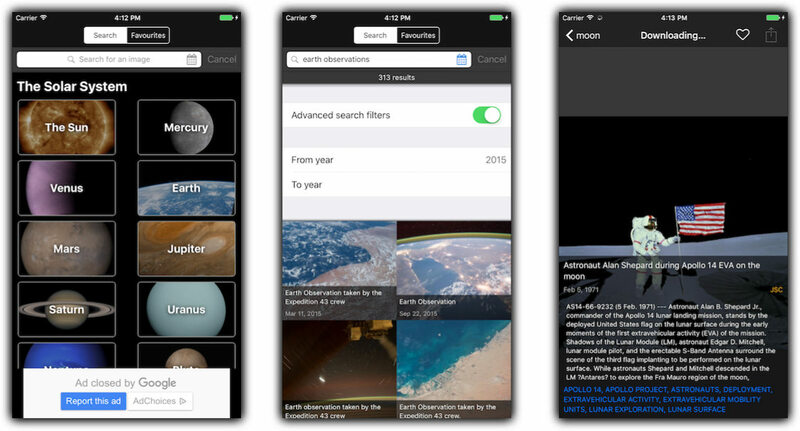 Returns thousands more images than the official NASA app! View the highest resolution versions of the images possible. Full descriptions of images, where available. Tap the calendar icon in the search bar to turn on date based searching. Set the date for and/or the date to, and only images taken in the intervening years will be returned. To view the full size version of an image, just tap it. The largest possible version of the image will be downloaded. (note that .tiff images are not downloaded, due to their very large size). The share icon is enabled once the full size version has been downloaded. Tap it to save to your photos library, or sent to messages or email, etc. Found an image you love ? Tap the heart button to set it as a favourite. This update removes all advertising from the app. Endeavour is now a paid download. This is a minor bug fix: if you have set a date range filter (by tapping the calendar icon in the search field) then this is now preserved when tapping other categories in the main menu. Top tip: this gives you an easy way to find the latest images. Set the ‘from’ date to the current year, and then just tap through the categories you’re interested in! Minor bug fixes and tweaks - makes the insertion point visible in the search bar, and adds a more obvious button to cancel a search and return to the home screen.